CBS News Investigative Producer Yvonne Miller-Halee and Kim Lengle wrote this story for CBSNews.com. CBS News has obtained a copy of the complaint that Frank Gwartney, a retired lineman in Anchorage filed last Friday, with Alaska's Attorney General, Talis Colber in Juneau. "Palin ran on the platform of ethics, transparency and anti-corruption. I'm tired of the hypocrisy that exists in Government and people need to know the truth," said Gwartney. The complaint against Governor Palin, alleges Misuse of Official Position: "Gov. Palin attempted to and in fact did use her official position for personal gain by securing unwarranted benefits for her daughters..." All the allegations contained in the complaint are related to state reimbursed travel. In Alaska, ethics complaints filed against the Governor are confidential. "We can neither confirm nor refute that a complaint has been filed against Governor Sarah Palin. Any complaint remains confidential unless the person being charged waives confidentiality or if the complaint progresses to the state of probable cause," Assistant District Attorney, Dave Jones told CBS News. 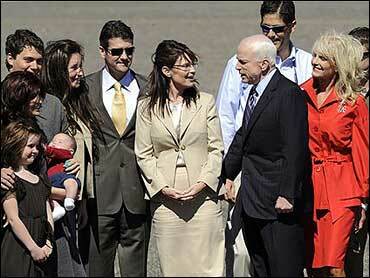 Bristol, Piper and Willow, Palin's daughters, accrued $32,629 in travel expenses while Palin's husband Todd raked up $22,174 - all billed to the state for a total of $54,803.00. "The Governor's office has expended $54,803.00 in Alaska state dollars for family travel since December 2006," according to the Governor's Administrative Services Director, Linda Perez. "The documentation related to family travel has changed and you have to keep in mind that the governor and her family are very popular," added Perez. Sharon Leighow, Deputy Communications Director, said "Governor Palin followed state policy allowing governors to charge for their children's travel and there's also the expectation that the first family participate in community activities across the state." This new ethics complaint comes on the heels of the Federal Elections Campaign complaint filed by Citizens for Responsibility and Ethics in Washington for spending $150,000 on pricey designer threads. CBS News previously reported on Palin's fashion expenditures and FEC officials said purchases for such purposes are prohibited. Campaigns are not allowed to spend donated funds on expenses a person would have had regardless if they were running as a candidate or in office. That includes items like clothing, mortgage payments, country club fees, rent, groceries, etc. The Attorney General will refer the complaint to the personnel board which is appointed by the Governor and currently includes: Debra English, Al Tamagni, and Laura Plenert. (No state employees sit on the board.) The board then determines whether the alleged conduct would violate the ethics act. If so, an independent investigator is appointed, evidence is gathered, and people are interviewed with the intent to establish probable cause. Eventually the board makes a decision and recommendations are made that may impose penalties, or disciplinary action, up to and including termination. The process can take anywhere from a few weeks to several months.